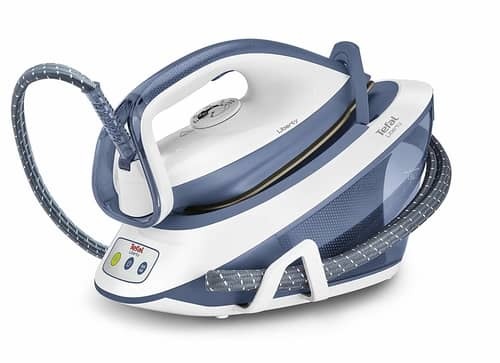 Thanks for taking the time to read my review on the Tefal SV7020 Liberty Steam Generator Iron. This is one of the more affordable steam irons in the entire Tefal range. You can usually pick this one up for under £100, depending on where you make your final purchase. This model is powered by 2,200 watts and comes in a very attractive light blue colour, as you will be able to see in the images below. This SV7020 model doesn't get the highest of reviews, but has still achieved a 68% buyer satisfaction rating. It takes about 2 minutes to heat up and after that period is all set to deliver highly pressurised steam to your garments. In the review below we explain the key features of this iron in a lot more detail. Who Would Buy the Tefal SV7020? How Buyers Rate the SV7020 Model? This model of iron is suitable for buyers who want a steam generator iron that is in the affordable price range. It does not have all the bells and whistles of the more expensive irons, but it is good enough to get ironing done quickly. Tefal is part of a bigger group who are known as Groupe SEB. They are a French company and a number of brands trade under this group name and include, KRUPS, Panex, Rochedo and Rowenta. Tefal have been around since 1956 and so have a strong 70 year history. They started out as being the first company to make non-stick pots and pans using a Teflon coating. Since then they have gone on to become a household name throughout the UK. Overall buyers gave this one an excellent rating of 68%. Normally for this type of generator iron you will see a much higher percentage of 5 star ratings. This model however appears to attract a lot of 3 star and 5 star reviews. (60-70% satisfaction ratings). The good news is that the number of bad ratings is very low as well at only 4%. So although the buyer ratings are not the highest, the price makes this one a popular choice for many buyers, especially for people on a tight budget. We now know how buyers rated this model, and in this section, we take a look at what buyers had to say about this model. We include both the good and the bad, according to real life buyers and users. We found the easiest way to keep this useful to read was to use a pros and cons table, which we have included below. This is a lower priced steam generator iron, but still has 5.4 bars of pressure with a solid steam output. According to buyers this one does a very good job of removing stubborn creases easily. Buyers liked the size of the water tank and also that it could be removed and carried to the tap and filled. It comes with one anti-scale filter cartridge, but these will need to be replaced to keep the iron working properly. You should consider that as running costs as filter prices are never cheap. A cartridge lasts for about six months and you get another spare one in the box. It has a vertical steam feature so ideal for steaming curtains. In addition to that, it also has an easy-carry lock and auto-off function for safety. This Liberty SV7020 has an ‘Eco Mode’ option. That helps reduce energy use by as much as 20%. Hopefully we have provided you with enough information to decide if the Tefal SV7020 model is the right one for your needs. It is certainly at the lower end of the price point for this type of steam generator iron. It does heat up quickly and has plenty of pressure to make getting through your ironing pile a great deal easier and faster. It also has an anti-scale feature that keeps the iron in good working order. 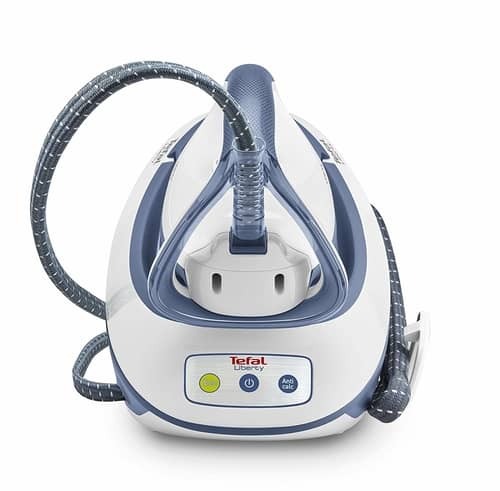 If this is not the right Tefal model for you, then please check out our top 20 list of Tefal steam generator irons by clicking here. If you prefer you can check out our top 10 list of all the different brands by clicking here.